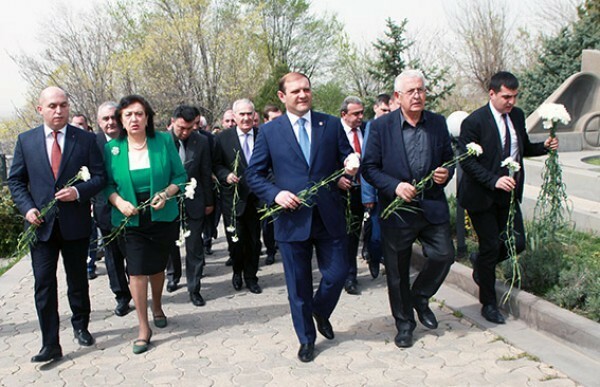 Representatives of the Republican Party of Armenia visited Yerablur today to pay tribute to the memory of RPA founder, Armenian political and state figure Ashot Navasardyan. Today, the politician would become 68 years old. Eduard Sharmazanov, Deputy Chairman of the RA NA, Armen Ashotyan, MP of the NA, Galust Sahakyan, MP of the NA, Yerevan Major Taron Margaryan, Ashot Navasardyan's relatives, friends and others were present. Armen Ashotyan noted that today Armenia needs politicians like Ashot Navasardyan. “My political activity was not during his lifetime; we joined the party after his death and know about him via his speeches, activities and biography," - Armen Ashotyan said. To the question whether Ashot Navasardyan wanted to see just such a party, Ashotyan replied: “I am sure he could both assess and criticize our job. Nevertheless, he would be proud of the fact that the first political party in Armenia today is the number one player in political life and, unfortunately, the only one among the creators of political content,” - concluded Armen Ashotyan. Ashot Navasardyan was a member of an underground United National Party. Later, he followed Garegin Nzhdeh's "Tseghakron" ideology, criticized the Soviet totalitarian system, defended the Armenian Cause. He was arrested three times for his ideas and sentenced to 17 years of imprisonment and 5 years of exile. In 1990 he founded the Republican Party of Armenia. He died in 1997.